Description of "Revolutionary Ideas for Corporate Success"
Corporate Success is one of the trickiest games to play. Sky high expectations, cut-throat competition and limited resources make this game not only demanding and challenging but also very interesting. This e-book attempts to provide the readers with practical ideas which will make the task of corporate success much easier! The simple points mentioned in this e-book if followed with sincerity will not only make you shine in the corporate world but also help in building an aura of power around you ensuring ever-lasting success. Read – Think – Apply – Succeed! Abhishek Ratna is an MBA from DoMS, IIT Madras and a Marine Engineer from M.E.R.I., Kolkata (Jadavpur University). He has special interest in Business and 'Work World' related affairs. He loves to travel and has been to more than 14 countries while working as a Marine Engineer on an oil-tanker. He likes to observe life closely, enjoys interacting with people and has keen interest in mentoring youngsters. He has been awarded an IQ of 156 on castle scale by Mensa International (http://www.mensa.org/) which is equivalent to top 1 percentile of world's population. He is presently employed with Citibank N.A. in Chennai where he lives with his lovely wife. Abhishek is actively involved in writing, editing and patrolling on wikihow. Abhishek enjoys sharing his thoughts and ideas on various topics related to business and life. 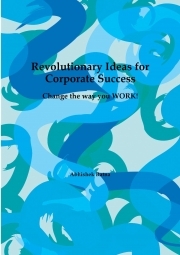 Reviews of "Revolutionary Ideas for Corporate Success"